Cover versions. Where would pop be without them? 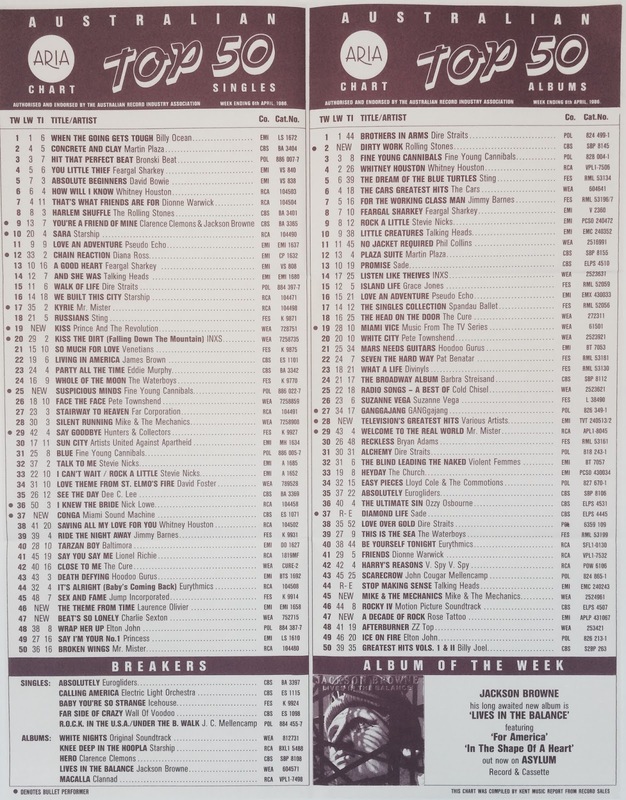 Other than the odd tropical house remake, you don't get so many of them these days, but back in the '80s, the singles chart was littered with covers. This week in 1986, two of the new entries on the ARIA top 50 (and one of the top 100 debuts) were songs that more than one artist has had a hit with. 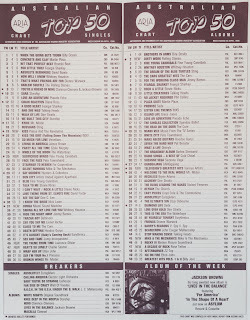 Of the top 50 hits, one was an update of a chart-topper from 1969, while the other was the original version of a song that'd be back in the top 10 for someone else in less than three years. As I've mentioned before, "When The Going Gets Tough, The Tough Get Going" was also a worldwide hit for more than one artist - except in Australia, where the Billy Ocean original is the only successful version. It was the number 1 song again this week in 1986. Taken from King Of America, a project from Elvis Costello and T-Bone Burnett, this much-covered song was made famous by Nina Simone, and had been a hit for The Animals (number 29 in 1965) and Santa Esmeralda (number 7 in 1978). Quite a change of pace from previous hit "19", this track featured lead vocals by Carol Kenyon, the voice of Heaven 17's "Temptation" and "Madam Butterfly" by Malcolm McLaren. According to Aaliyah, age ain't nothin' but a number, and for fellow early starter Charlie Sexton that number was 17 - his age when "Beat's So Lonely" hit the chart and the single's peak position in both Australia and the US. Spooky! A live performer since the age of 14, the singer/guitarist's power-rock sound wasn't that far away from Billy Idol's - not surprising since the two shared a producer: Keith Forsey. Unlike Billy, Charlie only managed two top 50 hits in Australia. We'll see the second in a couple of months. This one's a true oddity. Back in February, we saw one of Cliff Richard's contributions to the soundtrack to stage show Time, "She's So Beautiful". While that perfectly adequate pop ditty missed the top 50, for some reason this interminable spoken word track was a top 30 hit. I mean, seriously, who actually wanted to listen to this nonsense? Sure, the words might have been intoned by a multiple Oscar winner, but they were in character as Akash, the Ultimate Word In Truth, whose presence in the musical took the form of a hologram of a massive floating head. Seriously? Were there really more people prepared to buy "The Theme From Time" than this Latin-pop classic? "Conga" was the lead single from Primitive Love, the second English-language album by Miami Sound Machine (Gloria didn't get separate billing yet). Given "Dr Beat" had been such a big success in Australia, it's a little surprising that the just-as-energetic "Conga" didn't translate locally - it even had a dance built into its title! The track did, however, become the band's first mainstream hit in the US, peaking at number 10 on the Billboard Hot 100. No doubt the "acting" at the start of the music video helped. After a couple of top 20 hits, Fine Young Cannibals finally broke into the ARIA top 10 - but it took a remake to do it. Actually, a remake of a remake, since Elvis Presley wasn't the first singer to record "Suspicious Minds", although it's his hit version of the track that clearly influenced FYC. The song was originally recorded by its writer, Mark James, but when his release flopped in 1968, it was given to Elvis the following year - and became the King's final Australian chart-topper during his lifetime. Seventeen years later, FYC hit the Australian and UK top 10 with their version and channelled Elvis (and his unique dress sense) in the song's music video. Fun fact: Jimmy Somerville provides backing vocals on the FYC single. While Fine Young Cannibals were the second act to take "Suspicious Minds" into the top 10, here's the original version of a song that's also visited the ARIA top 10 on two occasions. 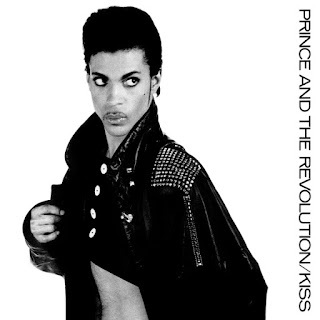 "Kiss" was the first new single for 1986 from Prince, who was keeping up the relentless release schedule that'd seen him put out seven albums already since his 1978 debut, For You. His eighth album, Parade (which also served as the soundtrack to Prince's second movie, Under The Cherry Moon), had a better start than previous effort Around The World In A Day, mostly thanks to the fact that everyone could agree on what song to kick things off with. Releasing "Kiss" as lead single was a no brainer, but the track almost didn't make it onto Parade, being added at the last minute. It was a good move to include it, with the song becoming Prince's most successful single since 1984's "When Doves Cry", just missing out on the number 1 spot in Australia (held off by "Chain Reaction"). In 1989, a new, non-falsetto version of the incredibly quotable track by Art Of Noise featuring Tom Jones reached number 8 on the ARIA chart - but that wasn't the first cover version of "Kiss". Later in 1986, British dance rock band Age Of Chance had an indie hit with their unique spin on the song. Next week: my favourite group of all time make their ARIA top 50 debut, while a band who were massive in the late '70s and early '80s have one final hit. Plus, The Damned, Wall Of Voodoo, Icehouse and more. I'm amazed the Animals' version of 'Don't Let Me Be Misunderstood' only peaked at #29 locally. Carol Kenyon also sang lead on Rapination's (a Rapino Brothers pseudonym) flop single 'Here's My A' in 1993. I didn't know the Charlie Sexton track; it has a very long intro for a single. There were some bizarre chart entries here in the 80's, and the Laurence Olivier track (which I'd also never heard of) must be one of the oddest. 'Conga' seems like it was a much bigger hit than #37. I had forgotten Jimmy Somerville did back-up on 'Suspicious Minds', even though it's obvious. Strangely, I don't think I ever heard 'Kiss' at the time. When I heard the Art of Noise version, it was like a brand new track for me, and I prefer it to Prince's. It seems strange now that a cover version of a #2 hit would reach the top 10 a mere 3 years later; but I suppose 3 years seemed like a long time back then.